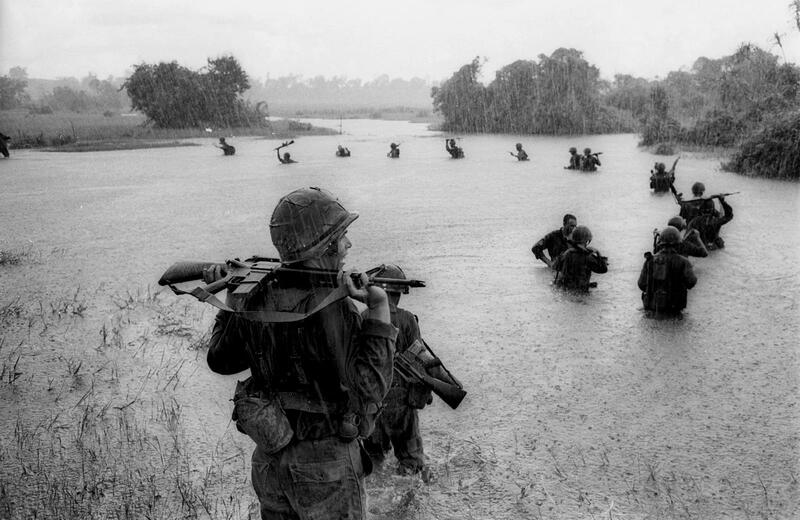 Paratroopers of the U.S. 2nd Battalion, 173rd Airborne Brigade hold their automatic weapons above water as they cross a river in the rain during a search for Viet Cong positions in the jungle area of Ben Cat, South Vietnam, Sept. 25, 1965. The paratroopers had been searching the area for 12 days with no enemy contact. As an expert in international affairs, Harvard University Professor Fredrik Logevall considers it crucial to study the Vietnam War, a complicated and controversial part of American history. Logevall was a child living in Canada when the United States pulled its combat forces from Vietnam in 1973. He has since written widely about the war and shared his insights recently at Illinois State University as a guest of the History Department. For decades, the war had a profound effect on U.S. foreign policy, but U.S. leaders -- and to some extent the public -- seem to have forgotten some of its major lessons, Logevall said on GLT's Sound Ideas. "The war made Americans, including elected leaders, wary of military interventions in far-flung places in the world -- not at all a bad thing. They refer to the ghosts of Vietnam in political parlance," Logeval said. Those ghosts haunted U.S. strategy for "a decade or so" and then began to fade, he added. Logevall calls it less a failure to learn, and more of a "failure to remember." There are some parallels, he said, between the Vietnam War and the conflicts the U.S. is engaged in today in Afghanistan, Iraq and Syria. "What Vietnam shows, and what these later conflicts show, is that local actors are ultimately key. If you are the United States, you need to have a indigenous local government that fulfills its end of the bargain, that is committed to working to sustain the country and protect its citizens. That was ultimately lacking in Vietnam ... You could say the same about our more recent conflicts." In the Vietnam era, there were skeptics within both the Johnson and Nixon administrations about continuing the war, Logevall noted. He maintains the war could have been avoided. Harvard University Professor Fredrik Logevall spoke on the Vietnam War as part of Illinois State University's International Speaker Series, sponsored by the History Department. "The most important finding in my research is that at the time there were people who said, 'Mr President, this is not a war the United States needs to fight. It is not a national security priority for the United States and what happens in Vietnam isn't going to be decisive to our security.'" Some advisors doubted that America could win even with major combat forces on the ground and sustained bombing of both North Vietnam and Viet Cong-held areas of the South, Logevall said. There remains today a strong belief that American military and technological might will prevail in any conflict, he added. "In the age of Trump ... the temptation to use military power becomes, if not irresistible, then very strong. But what Vietnam demonstrated are the limits to military power." He calls North Vietnamese Communist leader Ho Chi Minh a fascinating and "misunderstood" figure of the 20th century. "His government could be brutally repressive, and I in no way wish to romanticize Ho or his lieutenants or his government," Logevall said. Still, he believes Ho might have been willing to work with the U.S., despite his Marxist-Leninist leanings. "He was also a dedicated nationalist whom I think could have worked with the United States. He believed for a very long time that the United States, the product of its own anti-colonial action against Great Britain, would be there for him and his country. You could argue he was naive." Logevall said the anti-war movement played a role in the outcome of the Vietnam conflict because it limited the options available to Presidents Johnson and Nixon for executing the war. A larger issue, he said, were the doubts and disagreements within the government about how to prevail in the conflict. "Johnson, Nixon, and Kennedy before them, all had doubts about this struggle." Logevall's latest book on Vietnam is Embers of War. Though it is called the Vietnam "War," Congress never actually declared war on Vietnam. It is still, however, the longest conflict in U.S. history, dating from 1955 when early advisors arrived, to the fall of Saigon in 1975. About two thirds of the soldiers who fought in Vietnam were volunteers. Some 55,000 Americans and countless Vietnamese lost their lives in the conflict. Vietnam veterans, vets from other wars, school children and other community members turned out yesterday for the first day of the American Veteran’s Traveling Tribute Memorial Wall which will be up through 2 p.m. Sunday at Evergreen Cemetery in Bloomington. The Abraham Lincoln Presidential Library and Museum is honoring the nation's veterans by offering free admission to members of the military on Veterans Day. The Springfield museum also will display portraits of fallen soldiers from Illinois on a screen in the museum's main plaza. The ``Portrait of a Soldier'' exhibit, which features 287 hand-drawn portraits, will be shown alongside quotes about the military from the nation's 16th president. The portraits will be on display next week from Tuesday through Thursday.